On the final day of our Amazon River Cruise in Peru with International Expeditions, we made our way back up the river towards Iquitos. Along the way, we FINALLY had a chance to set foot on dry land with an day hike through the Amazon jungle. 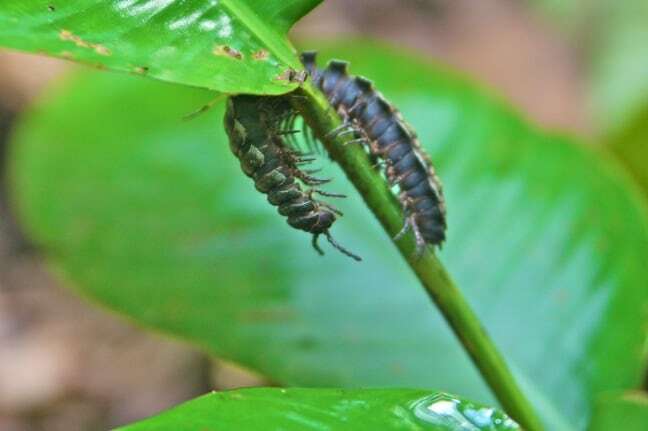 I’m 6’2″ and built like a linebacker, so I have no business loving rainforest settings nearly as much as I do– they’re sweaty, muggy and buggy. 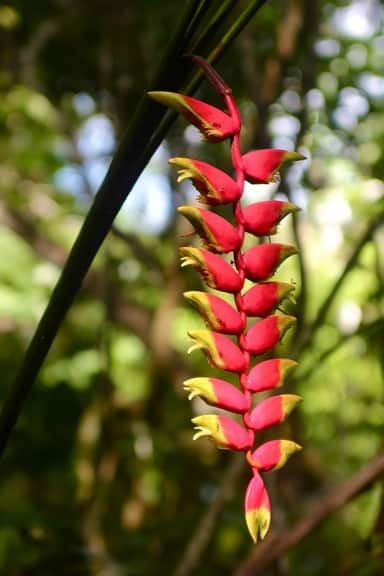 But there’s something about being surrounded by massive trees and gorgeous tropical flowers (such as this colorful heliconia) that feels very primal to me, like a real-life version of the Indiana Jones movies I loved as a kid. I think part of the allure is that being surrounded by all these massive, ancient trees and dense, impenetrable forest can make you feel incredibly small by comparison (a feeling a guy my size doesn’t get very often). But it also makes for a fun challenge trying to spot little things that might otherwise go unnoticed in all the lush green surroundings. I spotted this huge Centipede as we were walking along the narrow path that had been cut through the jungle, and let the rest of the group wander ahead as I got down on his level and relished my first good opportunity to fool around with some Macro photography. The wildlife viewing during our hike was quite different from the massive primates, birds and reptiles we’d seen during the previous 5 days. But, at least from a photography standpoint, it provided a welcome change of pace. 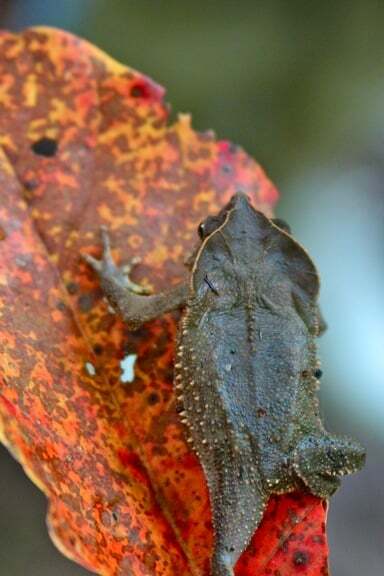 We loved getting such close-up views of smaller species like this Leaf Toad, which is known for its masterful use of camouflage, both to hide from predators and to lay in wait for its own prey. I really dig the shape of his head and the spikes on his side. 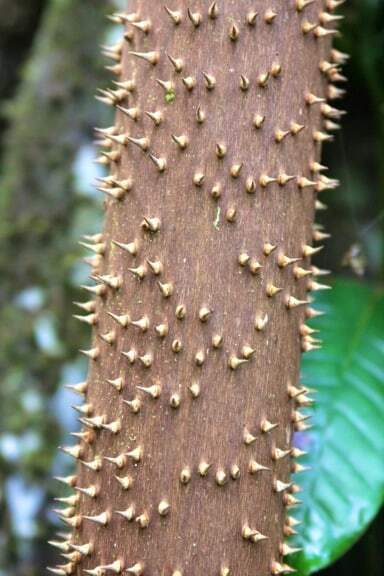 This close-up of the trunk of a Ceiba tree is another shot that would’ve been impossible to get on the boats. The Ceiba is revered in Mayan culture, and figures prominently in the myths of many pre-Columbian Mesoamerican cultures. 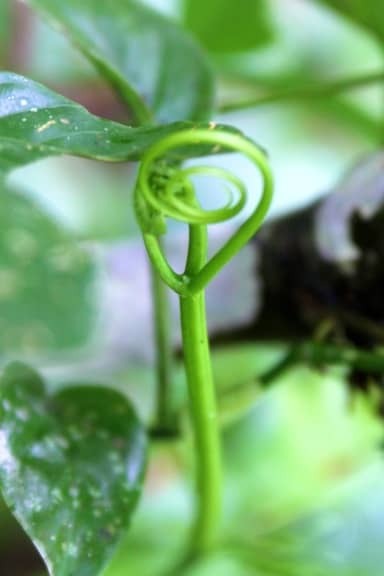 It is often depicted as the Tree of Life, connecting the planes of the underworld, the terrestrial world and the heavens, and it is often added to the hallucinogenic drink known as Ayahuasca. Looking at those formidable spikes, ti should come as no surprise that these great trees (which can grow to over 200 feet) command great respect. Though the secrets of the Amazon rainforest remained largely hidden from us, our machete-wielding guide seemed to have no trouble uncovering its myriad amazing animals. 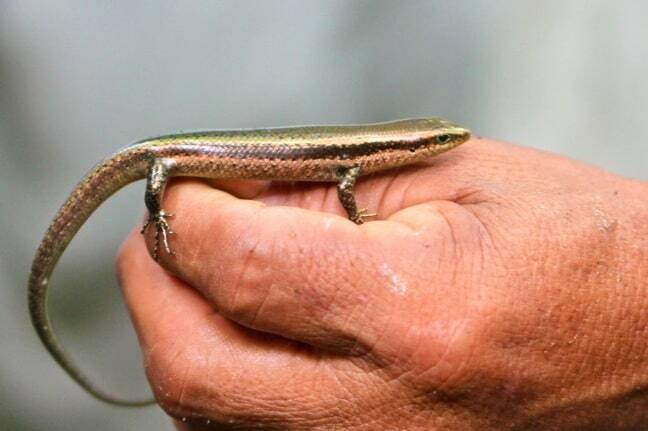 This little Skink was lightning fast, but then again they pretty much have to be: This lizard is a tasty snack for just about every predator in the Peruvian Amazon. Fortunately, their long tails can be shed quickly in a pinch, and if they can escape they’ll usually regenerate the lost piece. Kind of cool, huh? 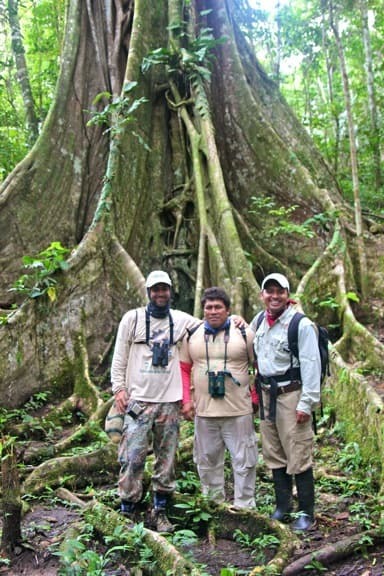 Because International Expeditions always divides travelers into two groups (in our case, it was 6-7 people in each skiff), it was rare that our expedition leader Renzo and naturalist guides Johnny and Usiel were all in the same place at the same time. But as we neared the end of our final hike on our final day before heading back to civilization, it was great to get a shot of the three of them together. It also provided great perspective on the size of the massive tree in the background, which towered above all the other trees in the vicinity. 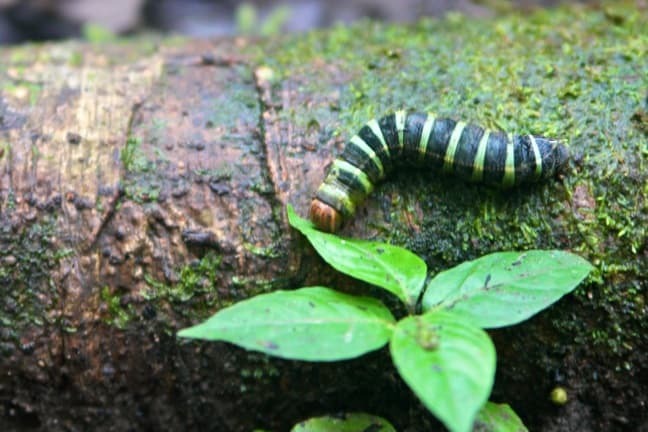 As everyone was crowding around to take pictures in front of the ginormous tree, I suddenly spotted this fat little Caterpillar, who was almost literally underfoot until I pointed him out. This was one case in which being excellent at camouflage almost led to a seriously squished species! We’d been hoping to see a Poison Dart Frog while we were in the Amazon, and fortunately our one and only day hike did not disappoint. 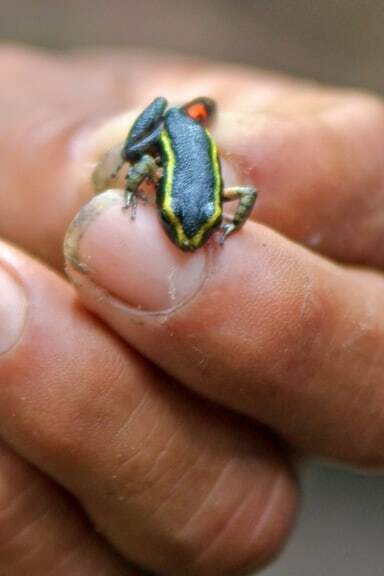 The colorful amphibians are called dart frogs because Amerindian tribes of South America famously used their toxic secretions (the levels of which vary greatly by species) to poison the tips of the darts for their blowguns. But only 3 of over 175 species have ever been documented as being used for this purpose, and the curare plant is a much more frequent source for the poison. Most of the Ribereños communities we saw were comprised of fairly plain thatch houses without much in the way of aesthetic embellishment. 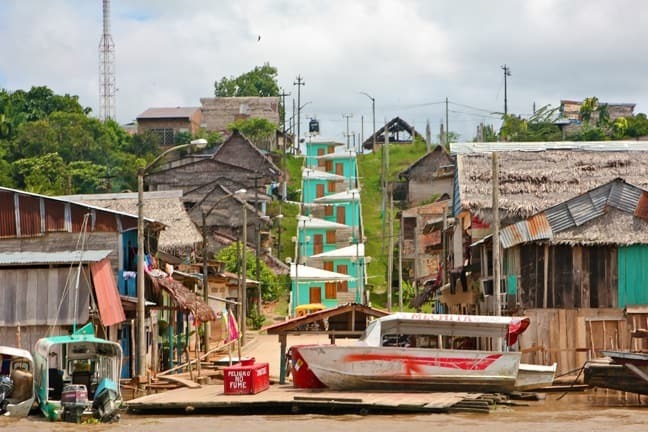 So it was almost jarring to see the vivid red and aqua hues of this village alongside the mighty Amazon River. The distinctive buildings in the center, we were told, were small market stalls that were bustling with activity on the weekend. But on this day, they simply served as a surprising reminder that we would soon to be getting back to “civilization.” I’ll admit that the realization made me a bit wistful, despite the fact that I missed my daughter and my dog terribly after our week in Peru. 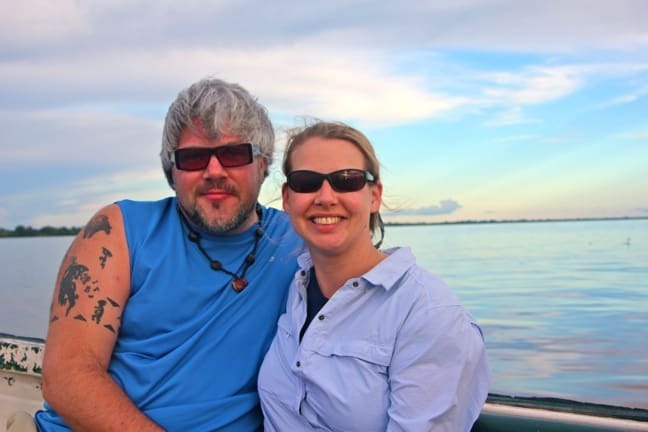 On our final Amazon river cruise, we went out for a brief jaunt in the skiffs, getting one last taste of the wondrous world we were leaving behind. As usual, we were met with beautiful wildlife sightings, despite being near the Iquitos port, including an adorable pair of saddle back tamarin monkeys who looked strangely frightened by our presence despite the fact that there was considerable distance between us (hence the lack of a decent photo to share). Suddenly we understood why, as the rising waters of the Amazon River claimed an entire patch of trees via erosion in just a few minutes, right before our very eyes! Fortunately, the tamarins made a hasty escape before the tree they were in slowly crashed into the river. 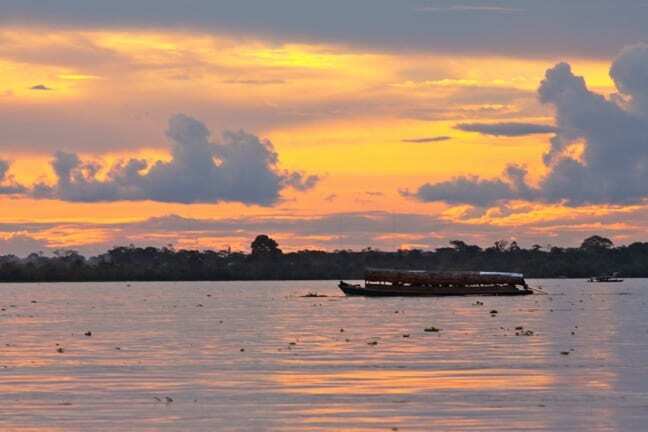 Check out International Expeditions for planning your own Amazon River Cruise. 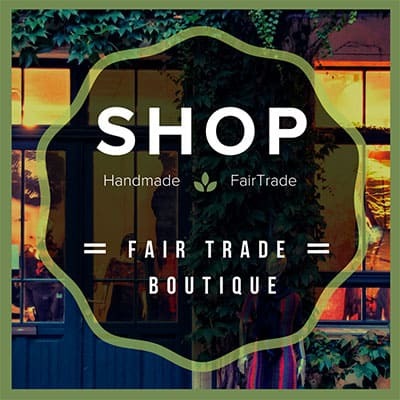 Mention Green Global Travel and receive $250 off per person, combinable with any other published IE discount. Right now that includes free international and in-country airfare from Miami.